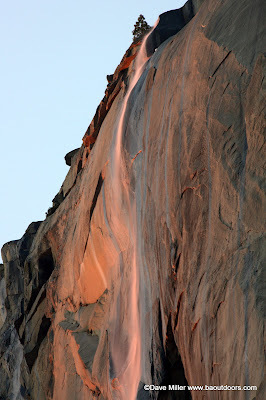 I just got back into town from my second attempt to photograph the Firefall at Horsetail Fall in Yosemite. I'm going to make this quick and follow up with more details later. Of the two nights, tonight's Firefall was the best, although it was more of a spark then a fire, I really got to get an idea of what this phenomenon can do. 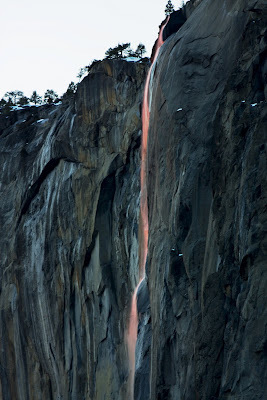 There was light on Horsetail Fall the entire first night, but it never really lit up just the "falls" to create that Firefall efect. However, it was still beautiful none the less! Tonight, the light on the falls disappeared just before sunset, but as our group waited, a slight glow started to appear in the water and then you could see it start to glow a faint orange. Unlike the previous night, only the falls lit up and not any of the granite around it. We were at a different location from the previous night with a different vantage point and a different look. Below are a couple of photos I quickly picked out. I've done some "normal" processing to the shots and warmed them up a bit to try to show what we saw there. So I didn't see the blazing Firefall, but I did get a little taste of it and I liked it! It was definitely an enjoyable trip that I will make again next year.